Natural gas prices continued to rally during most of last week, but during this week they have changed direction and tumbled down. The total NG demand declined last week mainly due to the drop in the demand in the power sector. The natural gas production rose while the rig count declined again. The EIA report also showed that both demonstrated peak working gas capacity and working design capacity are higher this year compared to 2011. The storage levels rose again but by a slower pace than last year. According to my rough guess at the current rate the storage will peak around November at 4,000. 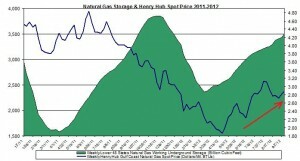 The underground natural gas storage (Billion Cubic Feet) rose for the twenty-seventh consecutive week; last week the storage levels increased by 1.95% or by 67 Bcf – the highest injection since June; the storage reached 3,496 billion cubic feet for all lower 48 states; the current storage is 8.6% above the 5-year average, and is also 10.1% above the storage during the same week in 2011 – these figures are slightly lower than the figures from last week. During the parallel week of September 2011 the NG injection was 89 Bcf and the five year average injection for the second week of September was 72 Bcf. Thus, the recent injection was lower than past years’ injections. According to my (very) crude estimates, if this trend will continue the storage level will peak around the middle of November at nearly 4,000 Bcf, which is higher than the storage level in 2011. The rise in storage was primarily due to a 44 Bcf injection from the Eastern consumption region storage. In the following chart are the changes (based on weekly figures) in storage (and Henry Hub spot price between the years 2011 and 2012. The chart presents the recent rally of natural gas prices. All awhile the storage levels are stocking up at a slower rate than in recent years. During last week the Henry Hub spot price increased by 2.1% to a weekly average price of $2.88/mmbtu. The Henry Hub price was still $1.07/mmbtu below its price during the same week in 2011. During last week the average U.S consumption, on a national level, fell by 3.72% (W-over-W). The consumption was still 5.2% higher than last year. The power sector led the fall with a 13.11% drop. On the other hand, other sectors’ demand rose led by the residential/commercial sector’s demand that increased last week by 12.93%. The total demand for gas was down by 3.88% than the previous week levels but was 6.2% above the same week in 2011. Imports from Canada fell during last week by 2.23%; they were 2.53% above the levels in 2011. The gross production rose last week by 1.57% and was 1.72% above the production level in 2011. As a result, the total supply of natural gas increased by 1.31% during last week. According to the report the natural gas rotary rig count fell by 4; by the end of last week the number of rigs reached 448. On a national level, the U.S temperatures were 0.3 degrees warmer than the 30-year normal and 0.9 degrees cooler than last year. The drop in the temperatures may have contributed to the decline in the demand for natural gas in certain sectors such as power.